The sun felt good this week as I noticed the plants beginning to rebound. Our spirits were dampened as was our production by the 19 inches of rain we got doused with during July. We have had to cut our losses on an entire round of tomatoes, squash, and cucumber plantings sacrificed to the weather. Even though there is acceptance of this fact you can still read the frustration on the faces of the farm crew who had shouldered all the work. I reassure the farm manager that the next batch up of tomatoes is sizing up nicely. 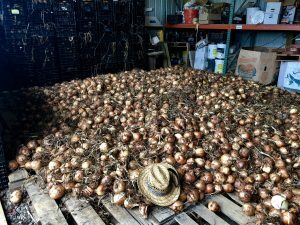 Upon arriving the farm I approached the barn where there is a dark mesh shade cloth covering the entrance and stacks of filled black crates and the floor completely carpeted with curing sweet onions recently harvested. That’s where I find the crew taking lunch. It makes me think of The Onion Cellar, a fictitious nightclub in postwar Germany from Gunter Grass’ Tin Drum where patrons go to chop onions and have a good cathartic cry in the company of others. To some extent that’s how it feels to mourn the loss of these plantings and the hours of staking, pruning, trellising and care that went into them. As I walked the fields I found plenty to be proud of and look forward to as well. Our cherry and heirloom tomatoes are prolific and look fabulous. There is a squishing sound as I walk the red carpet of cherry tomatoes I dub Gazpacho Alley after dropping a good bit of them in the row because of splitting do to rain. But the plants keep on producing and I can’t help but picking the ripest ones and popping them in my mouth. Okra is going gangbusters prompting me to research recipes and run promotions. Peppers are changing from green to vibrant yellows and reds and are like shiny ornaments on glossy leaved plants begging to be picked. I find the freshly planted beds of broccoli, cauliflower, and brussel sprouts making me look forward to fall just as the next planting of tomatoes gives me hope for September. Now that the sun is out I find myself emerging from a wave of exhaustion that has dogged me for the past couple weeks. With my kids coming home from camp, the addition of a new puppy to our family, and the realization that many of the students that staff our stands are getting ready to head back to school I come to a snap decision to plan a gathering at the farm this weekend for the entire crew. 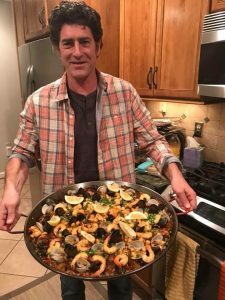 I’m going to make a big old paella and encourage everyone to bring a dish featuring ingredients from the farm or an instrument to play, sit by the fire and to laugh and enjoy the company, the food, and the setting and celebrate summer. Have a great week everyone.